The signs keep presenting themselves – a cooling in the air, leaves fluttering to the ground and shorter days. Fall is upon us. Hopeful gardeners in North Texas are taking all the necessary steps to ready their landscapes for the onset of winter. It can be tempting to just let the pond take care of itself, but for lasting impact in your landscape fall pond maintenance is necessary. You need to look after the plants and fish before Mother Nature unleashes a major chill. You will want to analyze how your pond handled summer conditions. Is the bio-load high? Are the levels of chemicals too great? Is there adequate oxygen? Conduct a water test to determine what conditions prevail. Then you will need to analyze what factors contributed to the conditions. This helps stay on top of possible issues and keep your pond as vital as possible. When the leaves start to fall you will need to bring out the mesh net. These pond nets are barely visible skimming just above the water surface and will greatly reduce the amount of twigs and leaves from falling into the water. The net should be stretched across the pond and anchored around the perimeter. As debris gathers simply remove the anchors from one side and flip everything off. Throughout the year stuff flying through the air and leaves from ponds plants will settle on the bottom of the pond. This unwanted vegetation will increase levels of organic compound build up and remove oxygen from the water. This can stress fish which are already sensing the onset of winter. It is necessary to remove as much settlement from the pond bottom as possible. You can start by pruning plants around the pond edges and discard floating plant material before decays sets in. If accumulation is heavy, use a fall/winter product that will help speed up the decomposition. This will also promote a healthier environment come spring. If your filtration elements are dirty they cannot work efficiently. They will work harder but results will be minimal. Your fall pond maintenance should include cleaning everything to ensure all continues to be in good condition. As the temperature dips just above freezing (around 40 degrees) you can remove the main pump, ultraviolet sterilizers and all filters. These elements can be put into storage. You do not want to continue running the pump on the pond bottom. This can drop the temperature of the water making it difficult for fish to survive. After you have pruned and scrubbed the bottom of the pond all that water circulation can stir things up. A change out of around 50 percent of the water is a good idea. You could do this anytime in the fall but it will be a less formidable task if you do it before the water temperature takes a big drop. If the water remains murky a day after the water change out, you should probably do a second water change. If your tap water contains chemicals like chlorine (and most all do) you need to add a water conditioner. 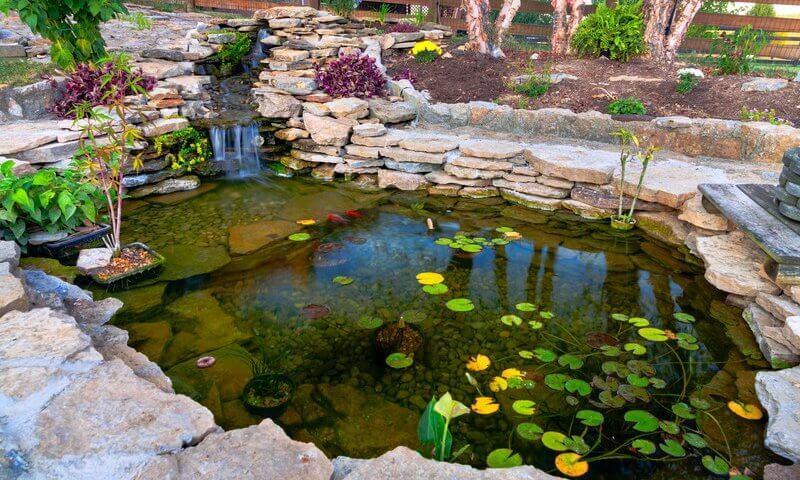 With the pond and filtering systems cleaned up, it would be to your advantage to keep your pond vibrant. Using an aerator will keep a steady oxygen level. Additionally, it will assist in keeping the surface of the pond from freezing. Using an aerator through the cold weather means you will have to set it up so that it draws warm air from an interior source. Without this source of warmth you can harm your fish. Once temps drop below the 40s, the aerator needs to be raised at least 12” from the bottom of the pond. When temperatures dip to below 70 degrees, you will want to begin reducing the amount of protein your scaled friends are fed. A low-protein food with added wheat germ will be easier to digest. Cool weather slows down their digestive track, so when your nights go down to 50 degrees, you should stop feeding altogether because the fish become unable to process food. While your pond friends do need to bulk up for the winter, don’t overfeed. You can give them food 2-3 times a day but only what they can eat in five minutes. Uneaten food rots quickly and can turn into a serious contaminant. Be sure to remove any excess food from the pond. Just as in your landscape garden, fall is a good time to divide plants and repot them. The mild autumn temps will give the roots time to re-establish before freezing weather sets in. Tropical plants should be brought indoors once the thermometer dips below 60 degrees. Before the first hard freeze, you should prune and move your hardy lilies deeper in the pond. But if your pond is shallow, you will need to bring these in with your tropical plants for the winter. With just this bit of work your pond and all its lifeforms should maintain their vitality through the winter months and come spring you will be ready to enjoy this lovely landscape feature once again.